How to educate the next generation of college students to invent, to create, and to discover--filling needs that even the most sophisticated robot cannot. Driverless cars are hitting the road, powered by artificial intelligence. Robots can climb stairs, open doors, win Jeopardy, analyze stocks, work in factories, find parking spaces, advise oncologists. In the past, automation was considered a threat to low-skilled labor. Now, many high-skilled functions, including interpreting medical images, doing legal research, and analyzing data, are within the skill sets of machines. How can higher education prepare students for their professional lives when professions themselves are disappearing? In Robot-Proof, Northeastern University president Joseph Aoun proposes a way to educate the next generation of college students to invent, to create, and to discover--to fill needs in society that even the most sophisticated artificial intelligence agent cannot. 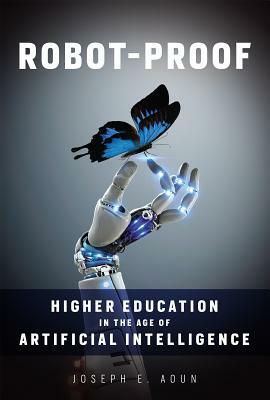 A "robot-proof" education, Aoun argues, is not concerned solely with topping up students' minds with high-octane facts. Rather, it calibrates them with a creative mindset and the mental elasticity to invent, discover, or create something valuable to society--a scientific proof, a hip-hop recording, a web comic, a cure for cancer. Aoun lays out the framework for a new discipline, humanics, which builds on our innate strengths and prepares students to compete in a labor market in which smart machines work alongside human professionals. The new literacies of Aoun's humanics are data literacy, technological literacy, and human literacy. Students will need data literacy to manage the flow of big data, and technological literacy to know how their machines work, but human literacy--the humanities, communication, and design--to function as a human being. Life-long learning opportunities will support their ability to adapt to change. The only certainty about the future is change. Higher education based on the new literacies of humanics can equip students for living and working through change.